With default settings, whenever you delete a file or folder by right-clicking on a file/folder and then clicking Delete option or by selecting a file/folder and then pressing Delete key on the keyboard, the selected file is moved to the Recycle Bin, and can be restored by opening Recycle Bin, right-clicking on the file/folder, and then clicking Restore option. As you may know, the root of each drive on your Windows PC has a protected operating system folder called $Recycle.bin. The $Recycle.bin folder is hidden by default, and you need to select the radio button labelled Show hidden files, folders, and drives option, and check the option labelled Show protected operating system files option under Folder Options (File Explorer Options) in order to view the hidden $Recycle.bin folder. 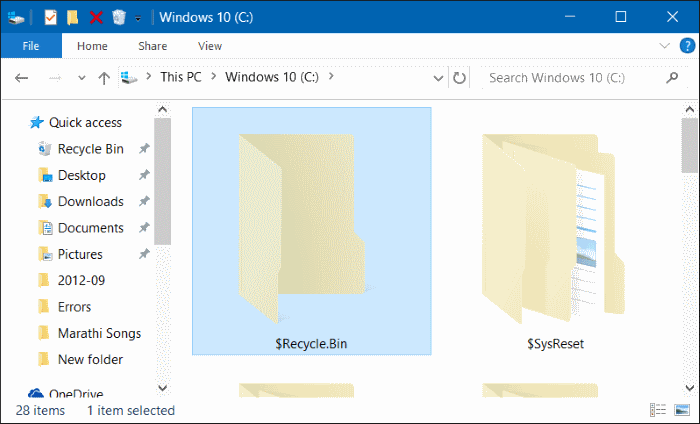 When you move a file or folder to Recycle Bin, the file is stored in this $Recycle.bin folder, and the deleted file or folder appears when you open the Recycle Bin icon on the desktop. If your system drive or any other drive running out of disk space or if you always delete files permanently by using Shift + Delete hotkey, you might want to turn off or disable the Recycle Bin feature in Windows 10. This method can also be used if you always want to delete files permanently when you delete files/folders instead of moving them to Recycle Bin. 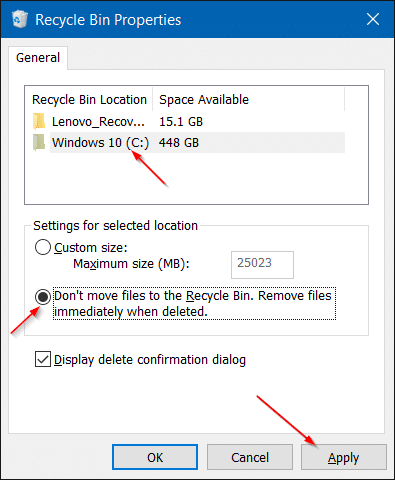 Complete the given below directions to turn off or disable Recycle Bin feature in Windows 10. 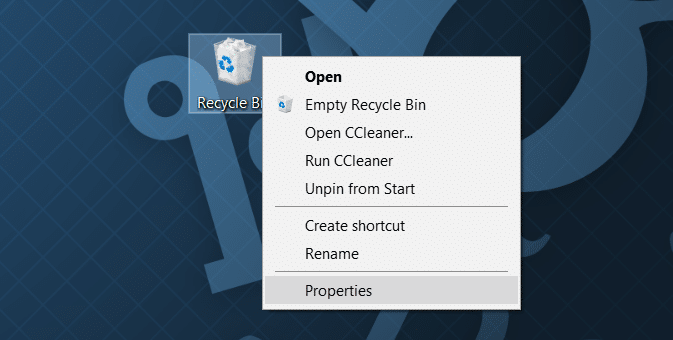 Step 1: Right-click or touch and hold on the Recycle Bin icon on the desktop and then click or tap Properties option to open Recycle Bin Properties dialog. If the Recycle Bin icon is not appearing on the desktop, refer to the directions in our how to show Recycle Bin icon on the desktop guide. Step 2: Here, under Recycle Bin location (see the picture below), select drive for which you want to turn off the Recycle Bin, and then select the radio button labelled Don’t move files to the Recycle Bin. Remove files immediately when deleted. If you want to disable the Recycle Bin for all drives, select each drive, and then select Don’t move files to the Recycle Bin. Remove Files immediately when deleted option. That’s it! From here on, whenever you try a delete a file/folder on the drive for which you have disabled Recycle Bin, you will see delete confirmation dialog with “Are you sure you want to permanently delete this file/folder” message instead of “Are you sure you want to move this file to Recycle Bin” message. Tip: As you can see in the picture above, under Recycle Bin Properties, you can also increase or reduce the default size allocated to Recycle Bin. Select a drive and then change the default size. How to enable or disable the delete confirmation dialog in Windows 10 guide might also interest you. windows 10 makes recycle bin folder on any drives after deleted even when switched off. Large clusters allocate for this resulting in wasted space. The one question no one seems to be answering is how to really control the Recycle Bin. I would like to see everything I delete stay in the Recycle Bin until I open the bin and empty all, or select some, of the items. I don’t want the Recycle Bin to be emptied every time I restart or shut down my computer. When I delete a file I may want a few days to think about it. Versions of Windows prior to Windows 10 operated this way. The user controlled when the files in the Recycle Bin were finally deleted. Big Brother, go away.